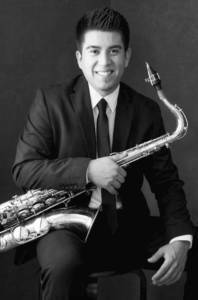 The Montclair Music Studio is Proud to Introduce Woodwind Instructor Abel Mireles. Mr. Mireles is currently accepting students on Mondays & Tuesdays. Abel has earned his Masters in Music from William Paterson University. Playing for over 15 years, Mr. Mireles’ experience includes teaching elementary and high school grades as well as 8 years of private instruction. Abel looks forward to creating a specific study plan for every student. This plan will be suited to the individual’s needs in developing a technical and musical approach to the instrument. Music was always in my family. My grandfather, father, uncles, and brother all play musical instruments. At first, I was not very interested until I discovered on my first music lessons, the possibilities of creativity. That really hooked me into music and ever since then, I’ve loved being creative through my music. As I mentioned before, most of my family was involved with music one way or another. My father made sure we had lots of different musical instruments around the house. I play most of the woodwind instruments (Alto, Tenor, Baritone, and Soprano saxophones. Clarinet and flute) Also, I can play basic Guitar, and Intermediate Piano. Music is my favorite profession and hobby. I love to make music as much as I can.